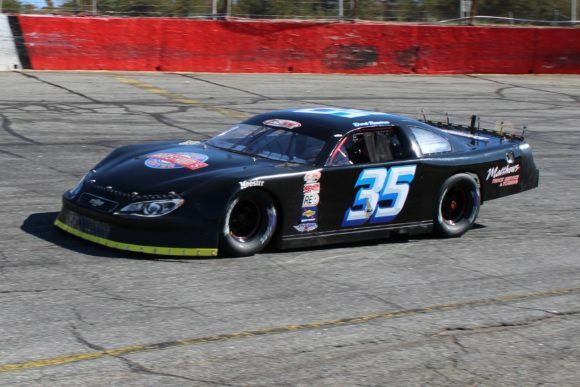 The Pro All Stars Series South for pavement Super Late Model machines made its way to Hickory Motor Speedway on Saturday afternoon to contest its final race of the 2018 season. At the end of the 13th annual Mason-Dixon Mega Meltdown it was Derek Ramstrom of Worcester, Mass. 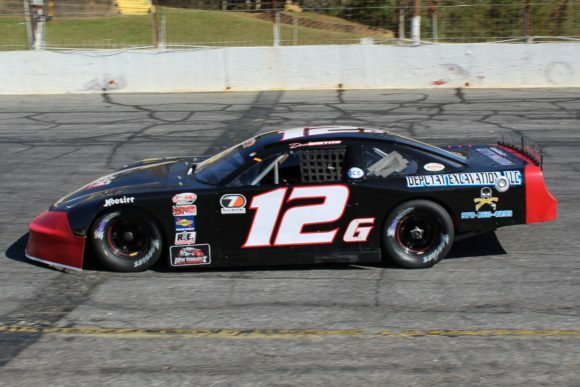 who came away with the win on the historic North Carolina track. 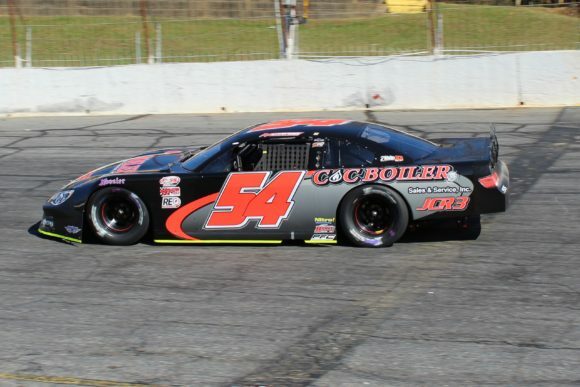 Matt Craig was crowned as the 2018 PASS South Series champion while Derek Griffith took PASS National Series honors for the season. Kodie Connor led the way in PASS qualifying as he turned a lap of 14.536 seconds around the third-mile paved oval. Matt Craig, Preston Peltier, Tate Fogelman, Jody Measamer, Brandon Setzer, Jake Crum, Wyatt Alexander, Derek Ramstrom and Derek Griffith rounded out the top-10 from time-trials. The PASS South Series employs a redraw for the top-10 qualifiers. The results of which placed Measamer and Connor on the front row with Ramstrom, Crum, Peltier, Setzer, Griffith, Alexander, Fogelman and Craig set to follow them to the green flag. At the start of the 200-lap main event it was Connor who took the early lead ahead of Measamer, Crum and Ramstrom. Those top-4 broke away from the pack in the early going leaving Setzer, Craig, Peltier, Griffith and Fodelman to wage battle for positions 5-9. Crum and Ramstrom worked their way around Measamer on lap 10 to take the second and third positions respectively while Griffith moved forward by passing Setzer for sixth. The No. 12G car then slipped by Craig, who had passed Setzer earlier, to break into the top-5. The fight closer to the front intensified on lap 27 when Crum took the top spot away from Connor. That, in turn, opened the door for Ramstrom allowing his No. 35 ride to move into second. The day’s first yellow flag waved on lap 35 after Lucas Jones went for a spin in turn two. On the following restart, Ramstrom took the lead for the first time in the race as he bolted ahead of Crum with Griffith and Connor contested the third position just behind the lead duo. Ramstrom broke away from his pursuers as Crum, Connor, and Griffith fought over spots 2-4 as the race reached its quarter mark. Griffith took the lead following and lap 60 restart and would hold it until another yellow flag waved on lap 84. As he had done earlier, Ramstrom emerged from a brief restart battle with Griffith to take the lead. However Connor would take another turn at the front of the pack on lap 102. The No. 45 of Connor would show the way until the PASS Series scheduled break at lap 125 which allowed crews to tend to their machines for a brief time until the cars were sent back the track to continue the battle. Ramstrom again proved tough to beat on restarts as he wrested the lead of the race away from Connor when the green flag was again displayed. With 50 laps remaining the defending race winner, Setzer, began to make his move as he passed Craig for fourth then moved by Griffith for third just six laps later. That set up an intense struggle at the front of the field with Connor holding the lead ahead of Ramstrom and Setzer. On lap 167 both Ramstrom and Setzer got by Connor to move into first and second respectively. Those two then began to fight for the lead as they worked in and around slower traffic. On lap 190 Setzer made his move as he shot to the inside of Ramstrom on the font straightaway. However, he found his path blocked upon entering turn one as the lead duo caught up to Gracie Trotter. Setzer made contact with Trotter sending her for a spin. Connor was left with no where to go and banged into the prone No. 2 car. Connor was eliminated as a result of the accident while Setzer was sent to the tail by series officials for his role in the incident. As he had done numerous times during the night, Ramstrom got the jump on two late race restarts and sailed under the checkered flag to take the victory. All content is property of Inside Circle Track (unless noted otherwise) and may not be used without permission.